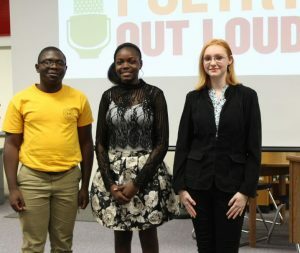 Each year, Caddo Magnet students compete in the Poetry Out Loud competition. Poetry Out Loud is a national organization that seeks to foster an appreciation for poetry. Students choose two poems from the Poetry Out Loud catalog and memorize them to prepare for recitation in front of judges and fellow students. Timothy and Keya will compete in the Regional Competition on 2/2/19 at the Norton Art Gallery, 1:00 p.m.